In the winter, cold air is drawn in near the ground to replace rising warm air. In hot weather the effect reverses, drawing in warm air at the roof to replace sinking cold air. 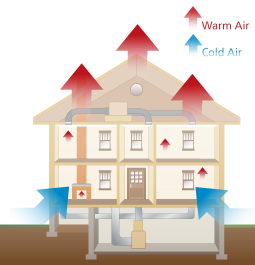 Natural air movement within a building, temperature differential between the heated and unheated spaces, and accessibility make the attic the most cost-effective location for insulation. However, insulating basements or crawlspaces can also have value in improving both comfort and efficiency. Therefore, these two locations are often the places to begin. Attics and basements are often moist or humid environments, and these conditions can greatly compromise the insulating factor of any material. Thus, good ventilation and moisture control are necessary to maintain a thermal barrier in these spaces. The Department of Energy provides detailed information about the various factors to consider when installing insulation in attics and crawl spaces. Ducts and pipes can also be sources of conductive heat loss. Wrapping insulation around heating and cooling ducts and hot water pipes can stop heat loss and enhance the efficiency of these systems. Use insulation that is intended for this purpose and install it according to manufacturer's recommendations for the best results. In general, adding insulation to the walls of historic buildings is not a cost-effective or sensitive treatment. Adding blown-in insulation to historic wall assemblies may trap moisture within the wall and lead to accelerated and often hidden deterioration of the structure. Proper installation of wall insulation involves the removal of historic finishes that can be damaged in the process. If walls are so deteriorated that complete replacement is required, insulation can be properly installed with a vapor barrier as the wall is repaired. It is best to limit insulation to attics and basements where it can be installed with minimal damage to the historic building.